If you’ve ever heard of Birchbox or Trunk Club then you already know subscription box services are HUGE right now. Everyone wants to try new things, but no-one wants to waste their time and money on something they just aren’t sure about. With subscription box services you get the best of both worlds. You get new or unique products on a monthly basis selected for you by experts and you get to do it without breaking the bank. I’ve said for years one of the biggest issues with getting drinkers to try new things is that no one wants to waste $30 on a full size bottle that they’ve never tried before. Then we end up drinking the usual stuff like Smirnoff, Bacardi or Jim Beam. Enter Flaviar: A Monthly subscription spirits company that offers you an opportunity to experience the best spirits from all over the world at a fraction of the regular price. Ironically I thought up this EXACT idea a few years back but wasn’t in the right place to really see it through. I guess I missed out right? So how does it work? Each month Flaviar curates 3 fine spirits for it’s Prime Members to explore in an new tasting box (Whisky, Rum, Cognac, Gin, Vodka, Grappa, Tequila,…) Each bottle is 45 ml and there’s no commitment. If you don’t like their experts selections you can choose to skip a month, swap a tasting box or select a bottle and just pay the difference in price. As a cool bonus your first month is only $18.99 and then $24.99 each month after that. When you find something you love, you’ve got the option to order the bigger bottle at any time, and another plus, prime members get free shipping on the full size spirits. It’s an awesome way to try before you buy. If you’re not a drinker but you know someone who is, they’ve got a pretty cool Gifts Section which lets you buy someone anywhere from 2-12 months of subscription service starting at 49.99. You select the first tasting box, and the recipient goes from there. It makes a great gift for under $50 bucks. 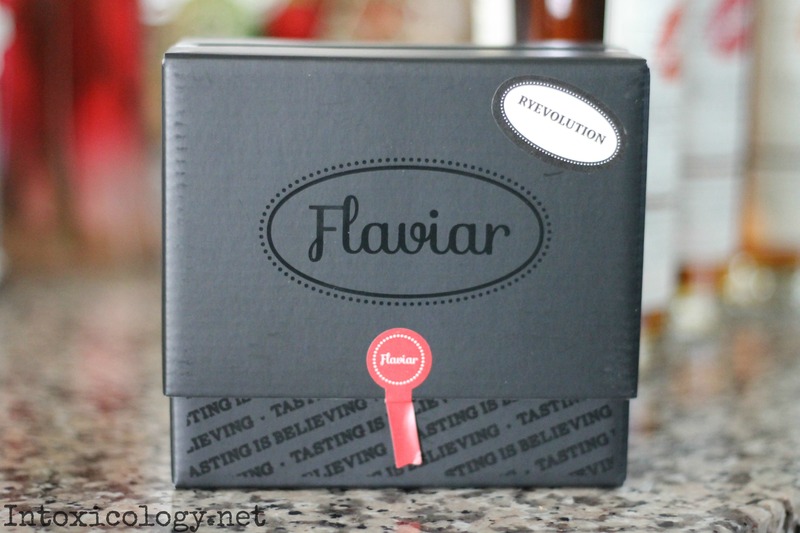 We’ve heard of Flaviar in the past, and even seen some ads around the internet, so we were pretty excited when they offered us a chance to sample a tasting kit ourselves. The box we received was a Rye whiskey kit that featured a good mix of brands we’ve heard of and a few unknowns as well. First Impression: We love the packaging. Flaviar comes in a sleek and compact black box that easily fits in most mail boxes and appears “discreet” enough to keep the nosey neighbors from judging you (haha). As you can see above, the 5 bottles are packaged perfectly in well designed 45 ml bottles that look closer to an expensive cologne brand than a liquor company. Few: FEW Rye Whiskey is aged in air-dried oak barrels and is a meld of 70% Rye, 20% Corn and 10% Malted barley in its mash. The aroma here suggests vanilla, brown sugar, cinnamon and wood with hints of butterscotch and citrus. The flavor here has fruit and some honey with citrus and spice as well. Prichard’s: Prichards is an American rye whiskey made from a mash of 70% Rye, 15% Corn and 15% Malted Barley. It’s aged in small, charred American Oak casks for up to 5 years. The aroma here is definitely citrus and honey, while the flavor suggests dark chocolate, vanilla, and sweetness. Rittenhouse: Rittenhouse is a single distillery rye that’s aged for 4 years and mostly made from rye mash. It’s light on the nose with some hints of vanilla and caramel and has a bold and sweet taste that features honey, red pepper and caramel and cinnamon. Verso: A Finland based single malt rye made from malted Rye and aged for 4 months in American Oak casks. Smells of honey and oak with a spicy sweetness that has bits of honey and cinnamon noticeable in the rye. Zuidam: A Netherland rye whisky thats 100 proof, 100 months old, and 100% rye grain. One the nose you get chocolate, pepper and spices, and a sweetness not unlike bourbon. It tastes like sweet rye with cinnamon, pepper, and spicy notes. Final Word: Overall I have to admit, as many times as I’ve seen their ads, I’ve never pulled the trigger. I wasn’t sure if it was worth it, but after receiving our first box we’re sold. Our Rye kit was amazing and as we mentioned we were fortunate to taste Rittenhouse and Few at Tales of the Cocktail last year, both great selections but Flaviar introduced us to 3 other really good brands, 2 of which we never even heard of before. We love the concept, but more importantly we love the price. At $25 bucks it’s a steal for the quality of brands you get. Done deal. I think the important thing to emphasize here is they don’t send you anything “monthly”. What you get for $20/month is free shipping (big deal!) and the supposed opportunity to buy liquor that you otherwise would not have access to. But if you look through their inventory you find that they are not really offering anything unique or unobtainable. The only thing I see beneficial is you can try samples to ensure that you don’t waste money on a full bottle of something that you might not like. But you still have to pay $20/month plus $40 and up (prices vary) for any samples that you want to try. It’s a complete rip-off and I just cancelled my membership. It’s an online community of sorts and not a subscription service. You pay their subscription fees for the chance to buy small tasting boxes at questionable market prices and to be allowed to purchase from their online shop. The packaging and accompanying materials that are included with purchases are very well made and expertly/humorously written (they have someone there who’s adept in prose), and they seem to be knowledgeable and capable in the world of tasting and spirits. If you’d like to subscribe to an online resource, and accompanying community and exclusive shop, then this is for you. If you’re looking for a monthly drinks box, like I was, then this isn’t it. Sadly, Flaviar’s “marketing” is ambiguous and vague (maybe on purpose) on this state-of-affairs, thereby snagging unsuspecting monthly-box subscribers like myself. We’re sorry you had a negative experience!